Meaghan McIntyre is a senior and the opinion editor for the sentinel. As a third year journalist she is excited to expand her knowledge and skills involving journalistic writing. Her hobbies consist of reading, writing, listening to music, and most of all playing softball. Ever since she started softball at the age of seven, due to her older brother having started baseball way before that, the field has always been like a second home to her. 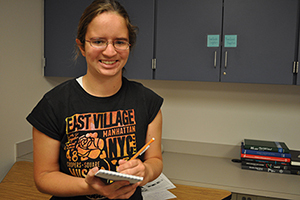 One of her biggest dreams is to be an author and she is hoping on self-publishing a book during this school year. She is hoping to major in communications so she can become a Public Relations Specialist for a company that has a product or message that she is passionate about. Her hope is to keep up softball in college. No matter where she goes to college or where she lives in the future, she always wants to have time to write.